Starting mid-March, Big G cereals will once again be going “Retro” with special edition classic packaging from the 1950s, ’60s and ’80s! For a limited time you can relive your childhood by heading on over to your local Target store’s cereal aisle, as Big G cereals have brought back their “Retro” themed packaging. (My kids loved seeing what cereal boxes looked like when I was their age!) To help celebrate the event, Big G has team up with Hasbro, offering a $5 coupon on Clue Vintage, Scrabble Vintage, Parcheesi Vintage or Risk Vintage board games at Target. 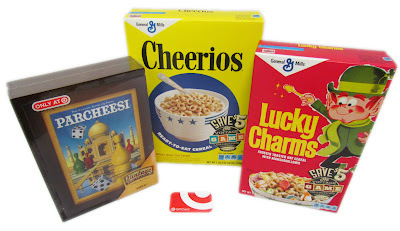 Print an online coupon for $1 off 2 General Mills cereals before you head to Target! In accordance to the FTC Guidelines and the WOMMA Code of Ethics, I am disclosing that this prize pack, information and giveaway have been provided by General Mills through MyBlogSpark. No compensation was provided. All opinions are, as usual, entirely my own. I loved Rice Krispies!...still do! I liked Rice Krispies with marshmallows. Cocoa puffs all the way! My favorite cereal was Life. Cinnamon Toast Crunch was my favorite! Lucky Charms was my favorite cereal growing up. cocoa puffs was my fav. I liked Frosted Flakes and Sugar Smacks. My favorite was Frosted Flakes!